Saints and Sinners Bowling is basically the sequel to RocketBowl, although this time the action takes place in bowling alleys instead of wide open spaces. The addition of special charms is an interesting angle, providing a slight advantage over your competition when used correctly. Each opponent has a distinct personality, and usually you're both joined by a spectator interested in watching the proceedings. Their banter is amusing to read, providing a distraction from the actual task in hand. 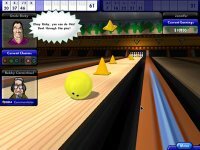 It's amusing to see computer-controlled bowlers attempting bribery, by offering you money to make a poor throw or two. Too bad you couldn't do the same as well. There are plenty of tournaments to join, bowling balls to unlock and charms to earn from defeated adversaries.